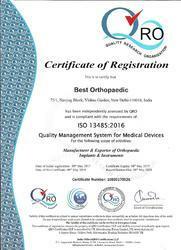 Established in the year 2002 at Delhi (India), we “Best Orthopaedic” are recognized as the prominent Manufacturer and Exporter of a qualitative assortment of Orthopedic Plates, Bone Screws, Interlocking Nails, Hexagonal Screwdrivers, Pin Clamps, etc. Our company is Sole Proprietorship (Individual) based company. Our firm is supervised by Our Proprietor, “Jagjeet Singh”. We reached at the remarkable place. We export our product to all over the world except Europe. Our firm has constructed state-of-the-art infrastructural unit that spreads over a large area. Installed with all the advanced tools and machinery, this infrastructural unit helps us to successfully fulfill our production targets. The work in this process is handled by our team members, who have rich experience and knowledge in the domain.